Be the first one to get a FREE 30-day Trial! I consent to the processing of my personal data, solely for the purpose of this communication. Consolytics delivers key benefits, resulting in no-risk business evaluation for numerous accounts. Are you looking for an accurate Google Analytics real-time traffic & e Commerce data consolidation and comparison? Do you need reliable currency conversion in one selected currency? Do you need lightning-fast marketing & commercial decision-making dashboards? Do you need flexible predictive analytics according to your most demanding needs? Looking for the added value of Google Analytics? the future of online analytics consolidation! 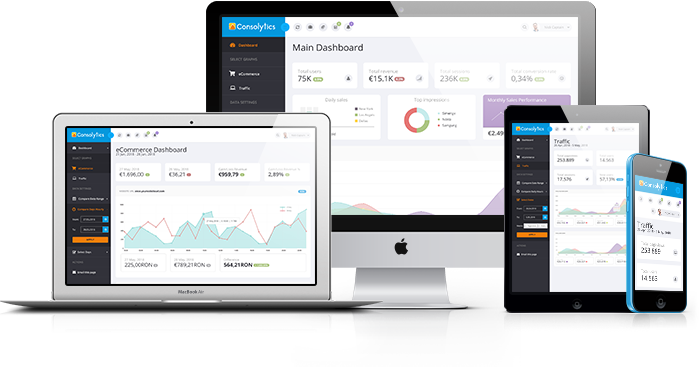 Consolytics is about an innovative data consolidation platform that will completely transform the way you do business! You will now be able to consolidate different Google Analytics profiles from various online properties, making use of a top-notch, mobile-friendly, online analytics consolidation tool. Consolytics: a unique online data consolidation platform, securing the ultimate online business experience. Place your focus on the future and keep moving forward! Let’s manage as many online properties as you really want! Don’t let your traffic analytics insights slip through the cracks. If you want to stop feeling overwhelmed monitoring your online presence, get a bird’s-eye view of ALL your traffic analytics, in one place, in one moment. Consolytics. 3 Online Shops in 3 Different Countries/ Currencies? Set up a default currency and get a thorough view of your e Commerce data. Consolytics supports all currencies, with hourly updates for all rates! Hungry for Future Traffic and e Commerce Predictions? We’ve got you covered! Consolytics makes use of 3 separate types of algorithms providing predictive analytics to keep you abreast of the times and in total control of your online presence. We are looking after your true concerns! Enjoy an environment, tailor-made for your online business. Consolytics identifies user behavior patterns by navigating the platform, making use of preselected features, and letting you design your interface experience for your own needs. Make smarter decisions, faster! Consult our rigorous reports and formulate better-informed decisions and strategy. Consolytics brings together all your traffic and transactions related data to enable snap decision-making with the lowest possible risk. Now, a single dashboard for all reporting! Get the full picture of your traffic and e Commerce projects! Compare date ranges and concentrate all date-related metrics per property/ per metric, as well as all transaction/ revenue metrics per property, 90% faster than manually! 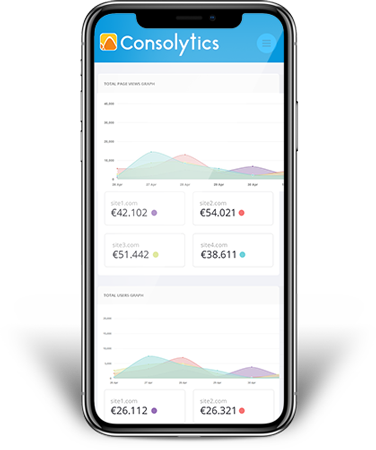 Drawing from a solid hands-on experience with hundreds of brands and 100 multinational corporations, Consolytics is ideally tailored to the needs and expectations of your online business. Now you can get Google analytics consolidation dashboards in mere seconds, instead of days – all in ONE exchange currency. Are you ready for extreme consolidated data innovation? Consolytics will be with you soon! Following an 18 months’ technology research session, our platform is currently in the Alpha testing stage. Get the first 30 days for Free! better than a Performance Digital Agency? Carrying out the development of a successful digital platform requires specific, specialized knowledge. The Globe One Digital expert team, drawing from a solid 20 years’ experience in PPC, SEO & Big Data projects built Consolytics, an innovative data consolidation tool that addresses the needs of the most demanding brands and marketeers. Globe One Digital Performing Miracles is our Science! Follow us and check our progress!